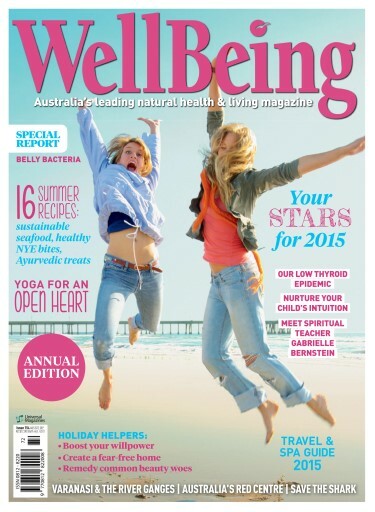 WellBeing issue 154 nurtures your spiritual and mental health. 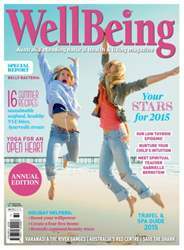 Learn how to reconnect with the inner self and cultivate spiritual wealth with activities that won’t cost you a cent, and join as we speak to modern-day guru Gabrielle Bernstein about the freedom spirituality provides. Uncover how your stars are aligned for 2015 then read on to embrace your wild imagination within, fire up your creativity and learn how to strengthen your willpower. Discover how to balance your belly bacteria for optimal health, dive into watsu massage and learn the importance of encouraging children’s intuition. Travel with us to Australia’s remote Red Centre, voyage on the Ganges River — then treat yourself to something special with the WellBeing travel and spa guide. Find our top home-grown harvest tips, read why shark finning and culling must stop, try our scrumptious seafood recipes...and loads and loads more!